[Adelaide, Australia] Bladers from Adelaide! I Currently Live In The Western Suburbs of Adelaide. I say ~ â™¥ Ryuuga â™¥ ~ Is Mine! Ryuuga is right where he belongs, with me! I Dare you to open up the spoiler.... DO IT! If there is any tournaments in SA please pm me. Also Im trying to get my brother and my friend Simon Gaze to sign up and get back into beyblades. Ok. I'm way tired of waiting. We really need to get this organized. SOON. Hey there, I am from Adelaide, and I am posting to tell you that. I am hoping that something can happen in 2011/This December. February 12th 2011. Adelaide Beyblade & LAN Battles presents February Blaze. This is my tournament in adelaide. How do I make it official WBO tournament? 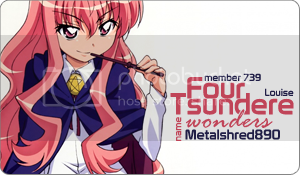 FTW Louise, Shana, Taiga & Nagi Are MINE! check the tournament proposal section and there should be a pined topic or something explaining how. it's pretty eyes to find, first go to the home page, look at official events, there sold be a sub forum called event proposals and look at the pin topics. done. thats 8 members to make it official but do note, members cannot vs non members in an official tournament. (Dec. 03, 2010 8:16 PM)pikabattler Wrote: thats 8 members to make it official but do note, members cannot vs non members in an official tournament. I'm from Adelaide but I'm only a 13 yr old kid.